Until 1974, Datchet, Slough, and neighbouring villages were part of Buckinghamshire, as they always had been. The administrative and political reasons for the change to Berkshire are scarcely remembered now, but it was Bucks County Council which drew up a Plan for Datchet in the late 1960s, very like the Royal Borough’s current Local Plan. The plan for development was much less comprehensive than the present one, but the familiar topic of traffic congestion was pressing then as it is now, and a new road to by-pass the village was being called for. Ten years earlier, Captain Bullock of the Parish Council had suggested a route from Major’s Farm Road, round the eastern edge of the village to reach Southlea Road, then crossing the railway line to Windsor via Old Windsor (see map below). It was incorporated into the Plan plus a western route, continuing the line of Major’s Farm Road and then turning south across Slough Road, the railway and the Golf Course to the Windsor Road. There was little objection to the eastern route, but absolute outrage at the idea of taking a main road on a viaduct across the golf course. Nearly 200 people filled meetings called by the Parish Council and the Residents’ Association, and letters were written to everybody, including the Queen. In the end, nothing happened. The eastern route may not have been possible due to the Reservoir which was already in building, and the western one is said to have failed due to the government’s stop-go spending delays in the 1970s. A lot of correspondence has survived about the 1970 Plan, almost all of it concerning the by-pass roads. As far as is known, there was little objection to the proposed increase in houses to provide for over 1500 people. Since 1970 all the sites identified have been developed, but it was a very slow process and there seem to have been no protests. The Eastern Section, shown as a spur from the top of Ditton Road, across Horton Road and the railway line to join Southlea Road towards Old Windsor. The reservoir was already in planning and the route skirts the edge of its site. There were no proposals in the Plan as to how by-pass could cross the railway line. The Western Section, continuing on the line of Major’s Farm Road past where London Road diverges to the village, then across farmland to the point where Slough and Eton Roads diverge. There were no proposals in the Plan as to how the by-pass might cross the railway line and then the Golf Course. Ruscombe Gardens site was held undeveloped until it was clear the land was not going to be needed for junction at Slough and Eton Roads. In 1966 the estimated population was 4,500, and was expected to rise to 6,000 in future; it is currently (2015) just below 5,000. As well as providing for population growth, some of the new housing was designed to improve run-down parts of the village. Two major areas, in Green Lane and Penn Road / New Road, were to be demolished as sub-standard and the residents rehoused. The descriptions of each plot are given here as in the Plan document; annotations are in italics. All the housing designated in the Plan has since taken place, as in the photos. 8½ acres, can house 410 persons; estimated 230 in this area at present so net gain of 180. Proposed for redevelopment (as sub-standard) but some recent houses are sound so should be kept. Future layout of this area must be considered as a whole; layout and density as area H3. 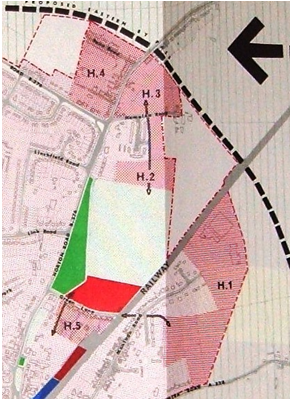 This plot was bounded on the N by the Linchfield Brook, which previously limited development but has more recently been culverted to allow more housing further north, into the rest of the outlined area which is white on the map. 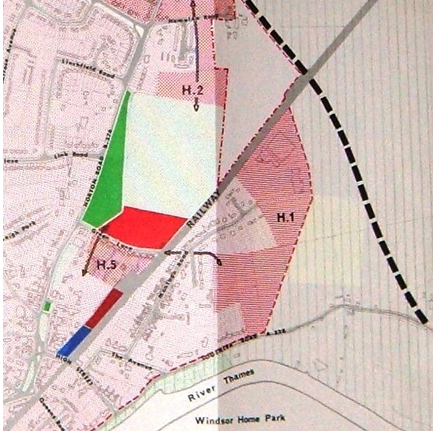 About 3 acres; already densely developed with housing (pre-1900 Wilton Cottages), 200 people estimated there who will have to be rehoused but not all can be rehoused on this site; should be a mixture of low and medium-rise housing.